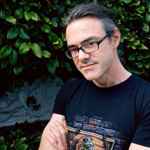 Jared Rivet is a horror screenwriter, producer, director, author, and voice actor. He wrote the screenplay for the Kevin Greutert-directed feature film Jackals (released by Scream Factory in 2017). Since 2014, he has written, directed and acted in multiple episodes of Earbud Theater, an award-winning audio drama anthology series specializing in horror and sci-fi. In 2016, he received an Audio Verse Award nomination for his performance in the Earbud Theater episode On the Line, which he also wrote and directed. He served as a guest lecturer at the Drexel University Great Works Symposium’s “Zom Con” in 2015; contributed an essay to the 2018 collection My Favorite Horror Movie; and he has co-hosted the monthly trivia event “Dead Right Horror Trivia” with Dr. Rebekah McKendry since 2015. He has multiple film, television, and audio drama projects in development and is currently in post-production on his latest Earbud Theater podplay, Tales from the Dead of Night, premiering in October of 2018. He can be found on Twitter at @jaredrivet1.